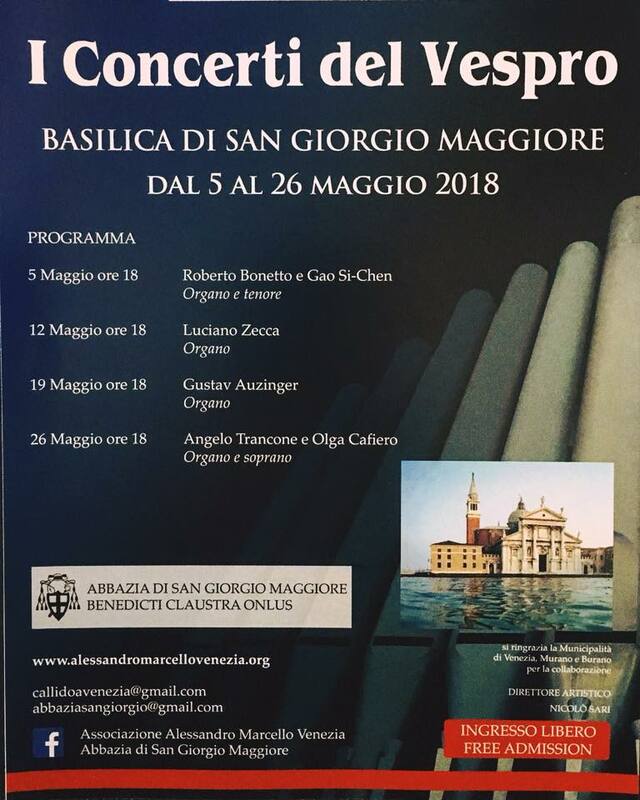 The Alessandro Marcello Association, in collaboration with the Abbey of San Giorgio Maggiore, Asolo Musica and the Archivio Vittorio Cini Foundation organizes "I Concerti del Vespro". On Saturday 12 May, the organist Luciano Zecca will perform a solo concert with the organ, with pieces by Sweelinck, Bach, Stanley and various authors of the Italian organist's nineteenth century. For the third appointment, Saturday 19 May, the Austrian organist Gustav Auzinger will lead a journey through the European Baroque repertoire. Saturday 26 May, two young and well-established Neapolitan musicians, the soprano Olga Cafiero and the organist Angelo Trancone, will present a program entirely dedicated to the Italian sacred music of the Renaissance and Baroque periods. All concerts will be free entry, starting at 18.00.